A proven methodology provides organizations with a solution to address the common challenges of dealing with electronic documents. Most organizations have a large inventory of electronic documents scattered across various storage locations. These documents represent both a valuable asset as well as potential liabilities. In addition, with the transformation to digital, the numbers of electronic documents created will likely continue to increase on an exponential basis over the next five years. The information represented in these documents represents years of business value, context for decisions and vital potential evidence for legal discovery. In order for organizations to harness and manage this asset, and to better utilize the value of this asset going forward while reducing the potential liability of this inventory of electronic documents it is necessary to take the appropriate action. It may not be possible to just “shut-down” shared drives. Marking everything as “read-only” may not be practical and as simple as it may seem. Some end-users have probably started migrating documents using ad-hoc and potentially risky methods. If end-users are not provided with a proven, organization-level solution quickly, things will likely get worse. Migration shouldn’t mean “make another copy somewhere else”. Not migrating documents to a central electronic document and records management system (EDRMS) will directly affect its user adoption. Integrity: How can we be sure that all documents were migrated integrally and reliably? Confidence: Will someone sign-off on the deletion of the source content? Chain of Custody: If migrated content is used for evidentiary purposes, have we affected the Chain of Custody? Mapping: Typically, the source and target environments are very different. Mapping is a significant challenge. Ownership: Who owns the information in the target environment once it is migrated? Original Metadata: Can we afford to lose the original context (creation date, modified date, owner, etc.)? Broken Links: Migrating documents change path structures. Links within files break. Safety: The migration process should not modify any document or its properties in the source location. Permissions & Access: Is the migration process opening or closing access too broadly? Security breaches or access deadlocks are frequent. Speed & Performance: With the wrong tools and process, this can be a significant limiting factor. Error-Handling: Older files can be corrupted or not accessible for various reasons. Handling these situations efficiently is crucial. Uncontrolled and undocumented movement of electronic documents may already be happening within organizations. Without a well-thought-out plan, future centralization for effective management and accessibility of these documents may lead to future issues and risks. Software tools by themselves are not sufficient to address the majority of the challenges identified above. 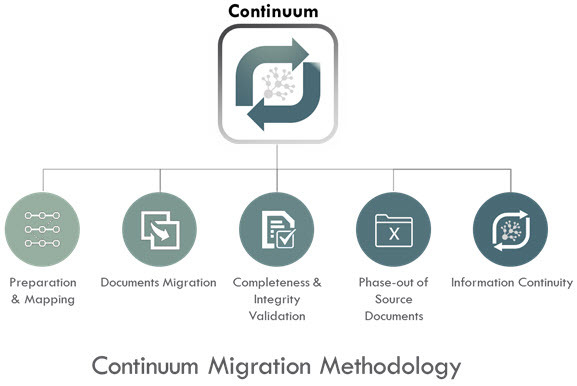 A proven methodology such as Continuum, provides organizations with a solution to address the common challenges of dealing with electronic documents. The methodology is represented by five steps as detailed below.